The existing Magaguadavic River Bridge was a 3 span continuous 3 cell cast in place reinforced concrete box structure which spanned the Magaguadavic River close to Saint George, NB. This bridge was replaced with a new adjacent structure as part of the Gateway project twinning Route 1. 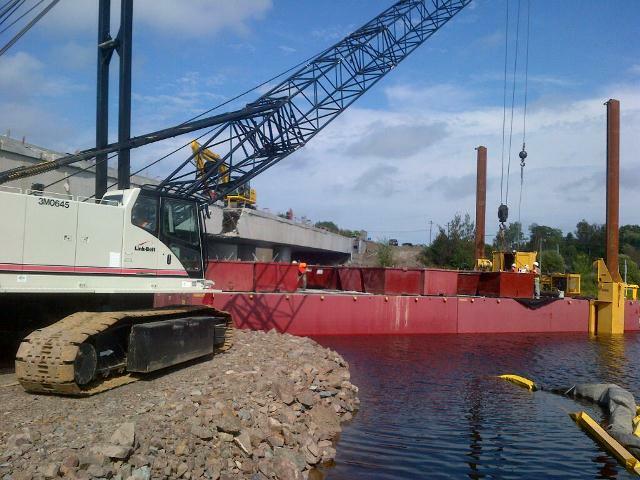 Harbourside Engineering Consultants (HEC) was engaged to complete an engineered demolition plan to remove the center 40.5 m span over the river. Due to costs associated with the existing geotechnical conditions, the contractor ruled out the use of any temporary bents to aid in the demolition plan. 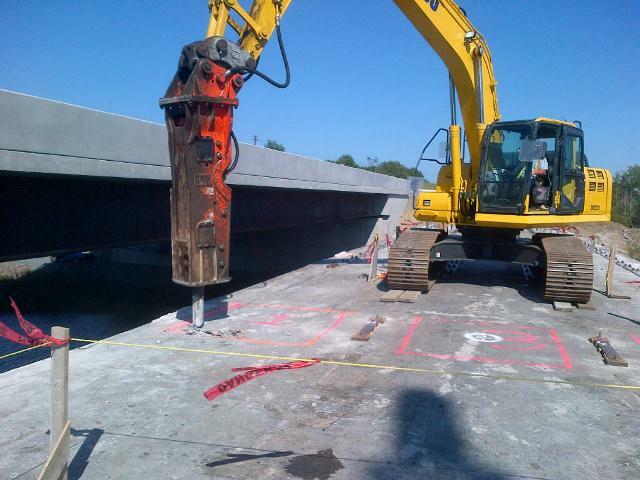 HEC developed an innovative demolition technique whereby the structure was broken at mid-span creating two prop-cantilevered structures which were then demolished with an excavator located on the deck with a breaker attachment. 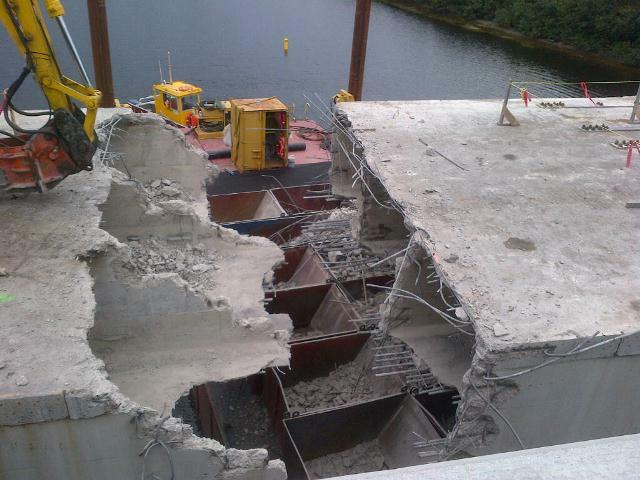 Debris fell into bins supported on a barge located in the river below. Due to the differential stiffness of the existing 3 span continuous structure compared to the broken prop-cantilever condition, measures had to be taken to strengthen the structure and limit any sudden stiffness changes during initial mid-span breaking. Strengthening was provided using bolted steel plates over the Piers increasing negative moment capacity. In order to mitigate the stiffness change, the superstructure was jacked down at the abutments lowering the mid-span dead load positive moments to zero, thus mimicking the broken cantilever condition prior to initiating demolition operations. Once the midspan section of the structure was in this zero stress condition, it was broken at mid-span with no change in the behavior and no sudden release of energy. To predict the required jacking to achieve proper stress relief at midspan, detailed 3D finite element models were created accounting for cracked and uncraked stiffness. In addition, the structure was constantly monitored during jacking by HEC using both survey and strain gauge monitoring to confirm the model predictions and ensure zero mid-span stress prior to breaking. Dexter Construction was able to quickly and efficiently demolish the center span of the structure using this innovative technique which required no external supports and provided significant schedule and cost savings to the contractor.